Envy of the Seven Deadly Sins is drawn to the Key and Dawn at the top of Wayne Tower in Gotham City. Manitou Raven's spirit appears to Green Arrow in Metropolis and creates a wormhole that spirits GA to Gotham. Later Raven does the same trick for Black Canary. Batman and Green Arrow attack the Key. 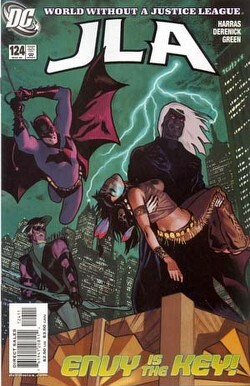 Envy possesses Green Arrow and Ollie attacks Batman. Black Canary arrives just as GA is about to kill the Batman! Story - 1: I've already put more time into this review than the writing deserves. Plus there's no Superman and this is his homepage. The downside of knowing that a year from now is only a few weeks away is that a filler story like this has nowhere to hide. If this is what the Batman is up to right before the Earth-2 Superman shows up in Infinite Crisis #3, it's no wonder he's lost the will to live on Earth-DC. The JLA is dead - they just don't know it yet. Long live the "Justice League of America" (which just so happens to be the title of the "One Year Later" League to be penned by writer Brad Meltzer). Art - 2: This is the same artist whose work I lauded three issues ago? The poor guy must realize he's stuck penciling a real dog of a story because he's clearly stopped trying. I counted about 20 of the same "open-mouth" pose on almost every character in the book. The biggest lesson of this issue must be that, if you become a super-hero, you won't get cavities. Cover Art - 3: Green skies at night. The world's at Crisis, and my eyes pick now to go color-blind!? !